For proper posture, better balance and strengthen the muscles, experts advise while in office not to sit on a chair, but on a big pilates ball. This way you can spend the excess calories. 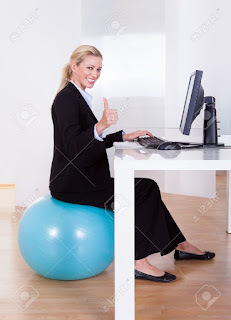 It has been proven that by sitting on the ball and balancing a PC in just one working day, you can spend at least 160 calories. While establishing balance, the body is always changing position, as well as improves concentration and circulation. In the pause time you can do light stretching exercises. Lie on the ball and set so that your back is leaning completely. Relax the hips and head and let your hands fall easily a side. Hold this position for about five seconds. Ready to use the arms and the legs? For this one, complete a traditional squat, while holding the stability ball with the arms extended overhead. Adding weight (nope, not quite light as air) while keeping the torso in an upright position engages the shoulders and deltoid muscles. Go for 10 to 15 reps of this bad boy.